Radial+ is a free circular Tetris like app for Windows 8 and 8.1 in which the object of the game is to move the blocks between the gaps in the circular rings. When you install and run the app on your device, you will be presented with a very simple screen where you can directly initiate the gameplay by clicking on the play button on the center of the screen. 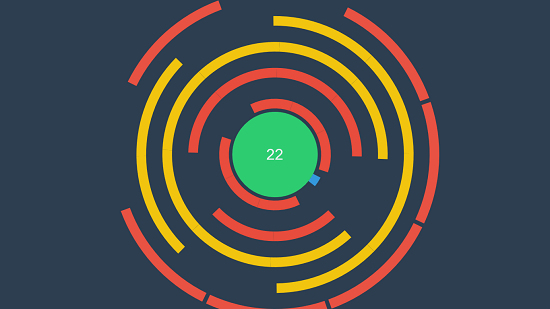 The gameplay screen consists of constantly rotating circular rings with gaps in between through which you have to guide the small block by clicking and holding on the screen in an appropriate way. Clicking and holding the click rotates the block in a direction opposite to the rotation of circular rings so that you can play the game, and this is what the gameplay is based on. The game gets difficult with passing time as the speed of rotation of circular rings through which you have to guide the block also increases. Radial+ is available for free from the Windows App Store. For Non-Touch Devices: Left Mouse Click. For Touch Devices: Tapping and holding the screen. For Devices With Both Inputs: Either of the above. Both types of controls work fully well. When you install and run the app, you will be presented with the main screen of the app itself which can be seen in the screenshot below. Simply tap on the Play button in the above screen, and the gameplay should start. The gameplay screen is shown below. In the above screen, the small sized blue block that you see at the center of the screen is the block which has to be rotated with respect to the circular rings which are rotating around this block. The circular rings rotating around the block are constantly decreasing in diameter so they will eventually collide with the block if it isn’t aligned properly with the opening of these rings. You can see the score at the center of the screen in the green circle. The score corresponds to the number of seconds that you have survived in the game. 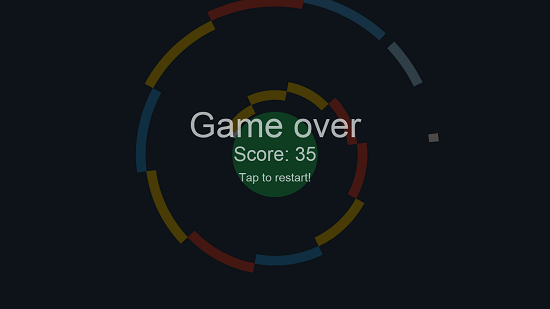 When you collide with the rings, it’s game over and you will be shown the game over screen along with your score. This sums up the main features of Radial+ for Windows 8 and 8.1. 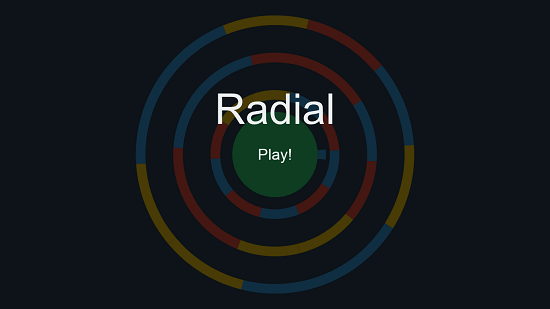 Radial+ is a really nice game with smooth graphics which tests your skills to cope up with changing environments. The game makes for an excellent download if you like fun and challenging games which are lightweight on size as well!